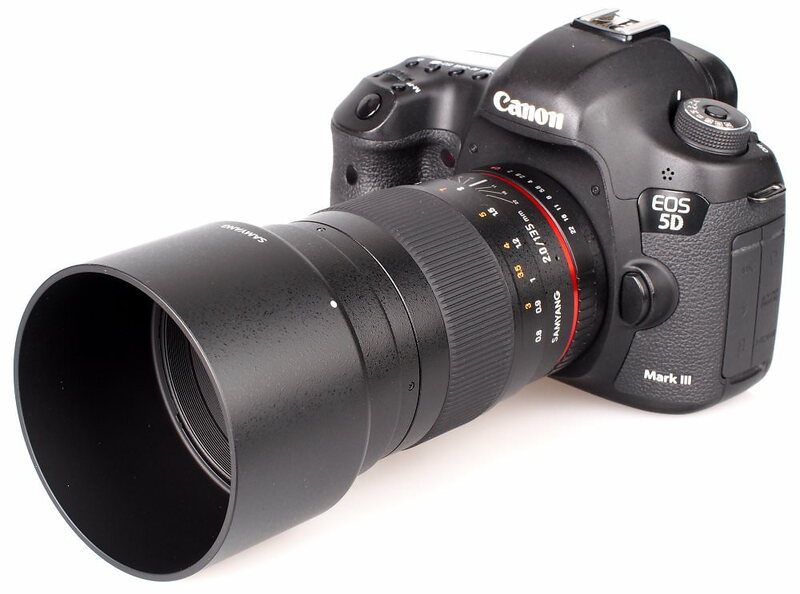 Gary Wolstenholme puts the Samyang 135mm f/2 ED UMC manual focus telephoto lens to the test. 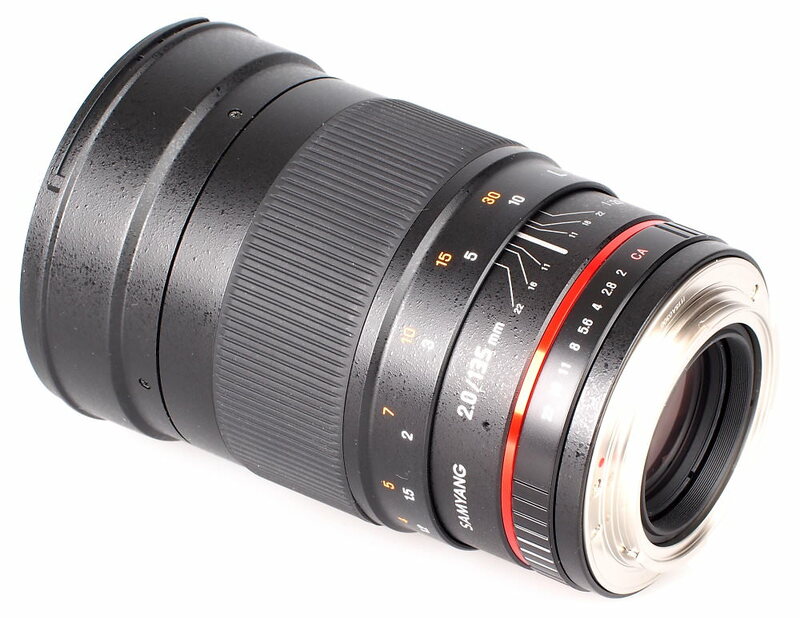 This lens is available to fit many different types of cameras, including Canon, Nikon, Pentax SLRs, and Micro Four Thirds, and Sony E-mount mirrorless cameras. In this review, we'll take a look at how it performs. A mix of high quality plastics with a lightly textured finish and metal have been used for much of the lens barrel, with a metallic red ring placed just after the aperture ring, denoting this is one of Samyang's premium lenses. This lens isn’t overly heavy for one sporting a fast f/2 maximum aperture either, tipping the scales at 830g. 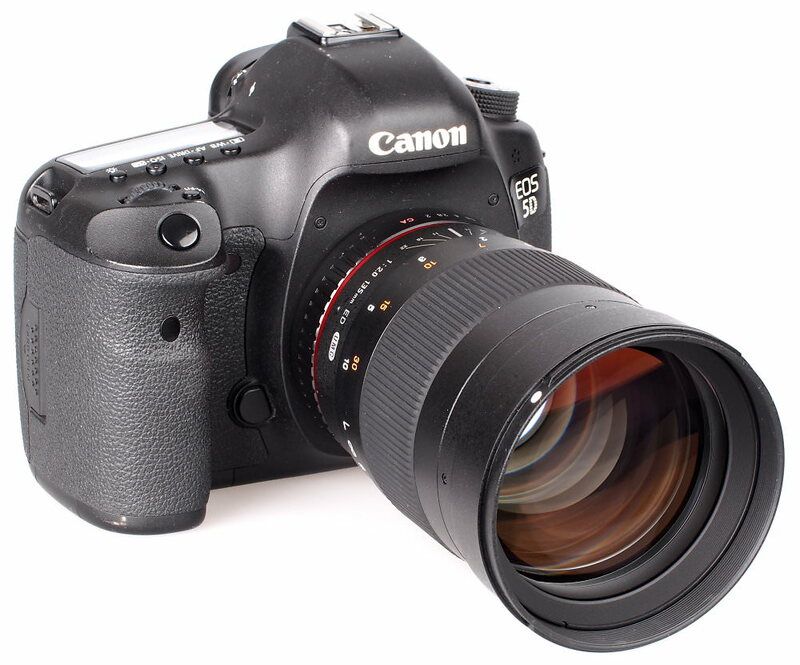 As a result, it balances well with the Canon EOS 5D MkIII camera body used for testing. Smooth damping makes the focus ring a pleasure to use, with it having just the right amount of resistance for applying fine focus adjustments. 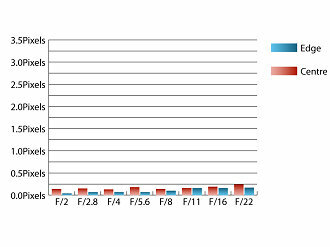 Closest focus is 80cm, which is fairly typical for a lens of this focal length and aperture. 77mm filters can be used with this lens and the filter thread does not rotate, which makes it ideal for use with graduated and polarising filters. A deep circular hood also comes supplied with this lens as standard. This lens has no electronic coupling with the camera, so stop down metering has to be used with the Canon camera used for testing. The camera reverts to centre-weighted metering and some automation is available in Aperture Priority mode. As this particular model of Canon camera does not give focus confirmation in the viewfinder when used with a lens with no electrical contacts, live view is the best way to ensure accurate focus. Other cameras, such as many of Nikon's high-end bodies have an electronic rangefinder, which makes focus confirmation easier through the viewfinder. A useful and clear hyperfocal distance scale is included, but there is no hard stop included for infinity focus due to the use of ED glass in the optical design. At f/2, sharpness in the centre of the frame is excellent, and towards the edges of the frame, performance is very good. 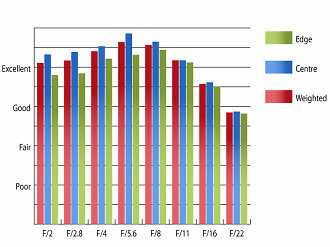 Stopping down improves sharpness even more, with peak performance being realised between f/5.6 and f/8. Here clarity is outstanding in the centre and excellent towards the edges of the frame. 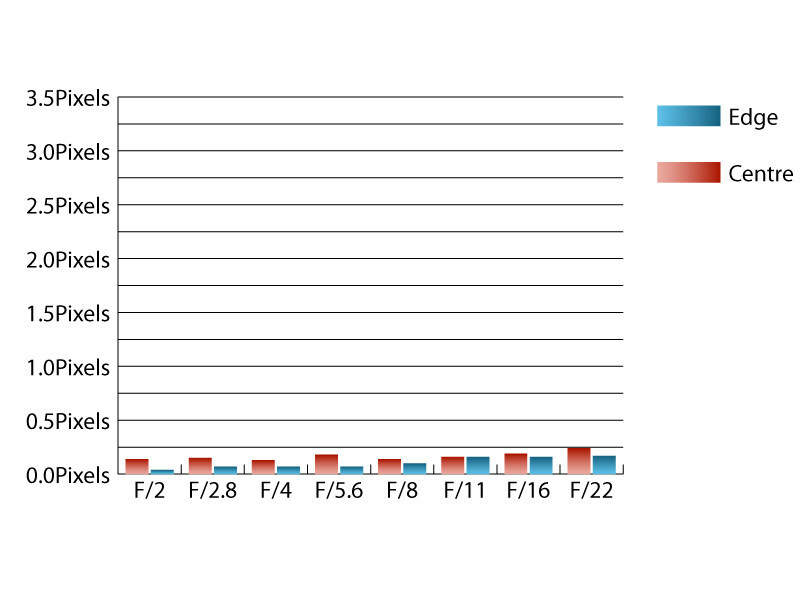 Chromatic aberrations are kept under control, remaining well under a quarter of a pixel width in size at all apertures. These low levels of fringing should be difficult to spot, even in very large prints, or harsh crops from the edges of the frame. Falloff of illumination towards the corners is quite strong, as is typical of fast standard lenses. The corners are 2.07 stops darker than the image centre at f/2 and visually uniform illumination isn't achieved until the aperture is stopped down to f/5.6 or beyond. Imatest only detected 0.112% pincushion distortion, which is an extremely low amount and should very rarely need correction in image editing software afterwards. There were few issues with flare with this lens during testing as the multicoatings applied to optical surfaces seem to do a good job of keeping this under control, as does the supplied circular hood. When shooting into the light, you may encounter a loss of contrast, but only in extreme examples of this kind of lighting. 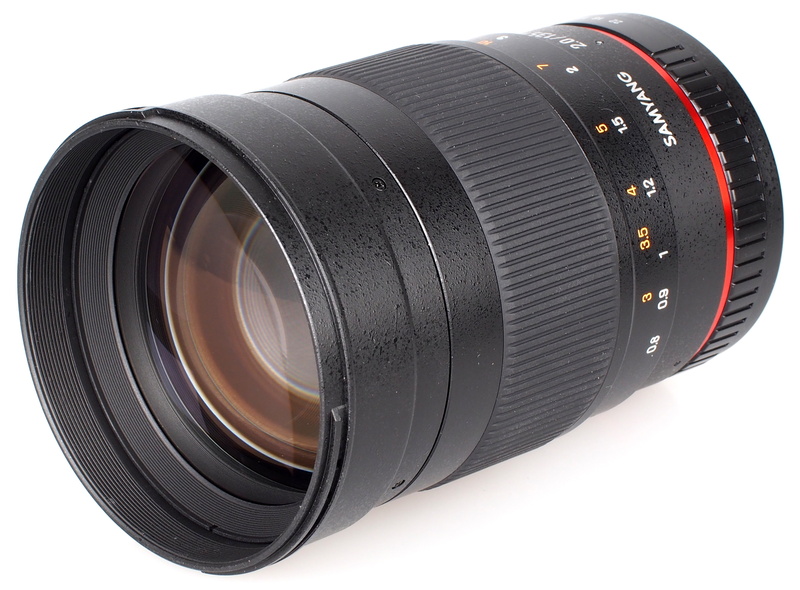 With a price of £380, this lens is just about the least expensive 135mm f/2 lens available. Canon’s 135mm f/2L USM lens costs around £740, but sports fast, silent autofocus with full-time manual override. Nikon’s AF DC 135mm f/2 lens has been around for years, but still costs over £1000 to buy new. This lens has screw-driven autofocus and includes an interesting defocus control feature that provides control over the appearance of out of focus areas. Those interested in a fast 135mm, who are either on a budget or don’t need autofocus for their work, should certainly consider this lens. It’s more than capable of delivering sharpness on a par with high-end lenses, but at a fraction of the cost. This, coupled with the excellent build quality and smooth manual focus action make this lens an excellent buy overall. The Samyang 135mm f/2 ED UMC delivers sharpness on a par with high-end lenses, but at a fraction of the cost making it an excellent buy. Makes you wonder what would happen if Samsung were to buy out Samyang and start producing autofocus versions of these excellent optics. The lenses appear to be a bit of a weakness for the South Korean giant's otherwise very strong offering with the NX1, with its Pro lenses just not seeming to get the best out of its capability. This lens is simply amazing! Would really like to use this with a 1.4x teleconverter. Any suggestions about which one would work best with this lens?